This weekend marks the start of the festive season, with the opening of Christmas Markets everywhere. While for most adults it is rather a busy and often stressful time I will always remember the magic that the “Adventszeit” as it is called in German Language brought for me when I was a child as well as for my children when they were young. I wish all of you a peaceful and and happy festive season! And enjoy all the great opportunity it brings on for us photographers! 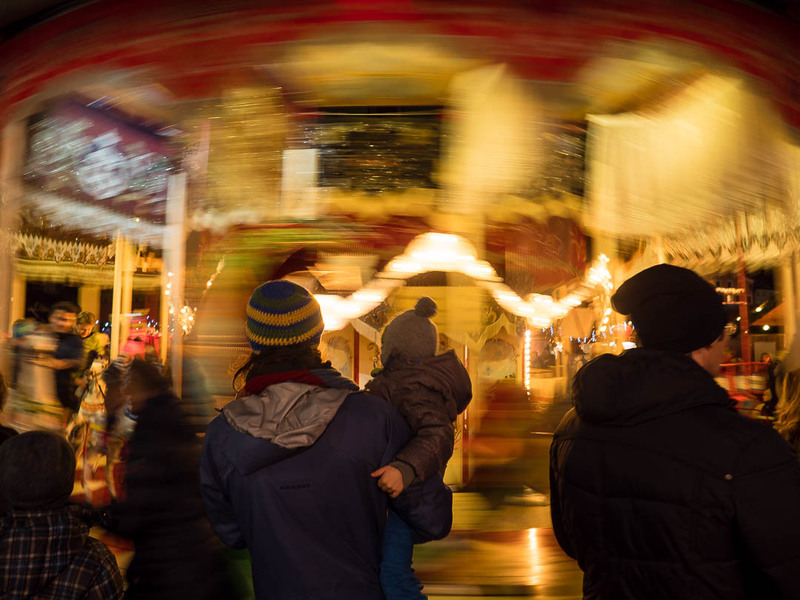 Love the photo… and it’s time to step onto the merry-go-round, hustle-bustle of the season, for sure. Danke, die Wünsche geb ich gerne zurück 😉 Sehr cooles Foto! Ich mag diese Kombi aus Schärfe und Bewegungsunschärfe! Immer wieder toll anzusehen!! Wishing the same to you as well! I look forward to more holiday shots on your blog (or puddles) 🙂 This one is fantastic! Thanks, the first visit to a christmas market is always special! This image is festive and greets the whirlwind of the holidays, Marcus! Great job. Happy Holiday, may you find time to relax with your loved ones and experience many new special memories. Thanks so much for the wishes! Relax will be difficult has I have a trip to Dallas scheduled this week and another US trip to NYC on my agenda next week. But spending time with friends in their mountain hut near Innsbruck this past weekend helped me unwinding a bit. Take care! May this time of year will be also peaceful and wonderful for you! Ich wuensche Dir und Deiner Familie ebenso eine schoene Adventszeit. I just heard the 2 neighbor girls singing The Twelve Days of Christmas, and remembered when I sang it to my daughters in front of the department store windows with each verse displayed! Thanks for your visit and comment. This is also what photography is about, bringing back the memories!